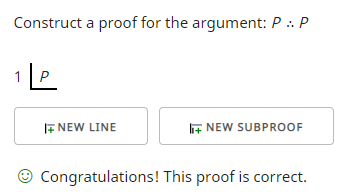 Premise 1:  All B is C.
Premise 2:  All B is C.
Conclusion: All B is C.
However, using the proof checker associated with forall x: Calgary Remix I can construct a valid argument in truth-functional logic using "reiteration" (page 123-4) by repeating a line I already have. Could this reiteration rule, or permitting conjunction introduction to use two identical conjuncts, be considered begging the question? 5.13. There is nothing that excludes a formal proof from possessing only a single item. 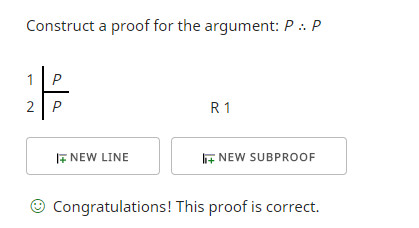 The following single-item proof is a hypothetical proof of p on the hypothesis p. It is a proof of p in the sense that p is the last (and only) item of the proof. Fitch, F. B. (1953). Symbolic Logic; an Introduction. The premises do not serve as grounds or reasons for accepting the conclusion. There is no 'flow' of justification from the premises to the conclusion. One would not accept the premises if you did not already accept the conclusion. John Stuart Mill criticised deductive reasoning (or at least, some particular syllogistic forms) as being entirely question-begging because the premises would not be accepted unless we already believed the conclusion. One of his examples was: "All men are mortal; Socrates is a man; therefore, Socrates is mortal". His complaint is that we would not accept that all men are mortal unless we already believed that each individual man, including Socrates, is mortal. The point is debatable, however, since we might argue that the mortality of all people rests upon far better evidence than merely an inductive enumeration of the dead. There are good scientific reasons to accept many universal claims. Also, there are cases where accepting a universal premise does not depend at all on a prior acceptance of the individual instances. Consider for example: "All dollar bills are legal tender in the USA; this is a dollar bill; therefore, this is legal tender in the USA". This argument is not question-begging. I do not need to examine each dollar bill to discover that they are all legal tender. They are all legal tender by fiat, because of an act of an appropriately constituted authority. And knowing this fact gives me reason to believe that my dollar bill is legal tender. So, not all valid arguments are question-begging. Rather, one must consider what the reasons are for accepting the premises and the conclusion. An important corollary of this is that I might consider a particular argument question-begging while you do not. We might disagree because we have different background beliefs and these affect our reasons. If A and B together entail C, you might believe A and B and claim that this provides an excellent reason to believe C, while I might consider C to be so absurd that I reject the argument as question-begging and prefer to disbelieve A. Sometimes this is expressed by saying, "One person's modus ponens is another person's modus tollens", or even "One person's proof is another person's reductio". It would be begging the question if someone does want to claim that P is true, but then assumes P in order to 'prove' P.
But in logic we're not concerned about truth, just implication. p ⊢ p or p & q ⊢ p.
Therefore, "begging the question" is considered a fallacy only because the term "fallacy" is not used precisely: in everyday use, the word "fallacy" does not always imply an invalid argument. "Begging the question" often merely implies that the argument is not an interesting one, because the premises too obviously contain the conclusion (this is exactly what your quote from Aristotle entails). Nonetheless: In formal logic, "begging the question" cannot be considered a shortcoming, because it is unavoidable if the argument is to be valid. Not the answer you're looking for? Browse other questions tagged fallacies symbolic-logic syllogism or ask your own question. Why is this question begging?